Would you like to add emails from form submissions to your AWeber lists? 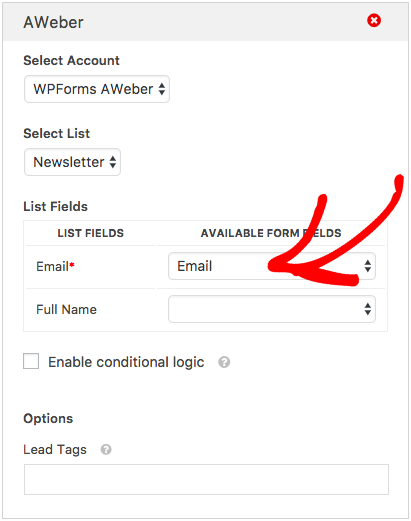 By connecting AWeber with WPForms, you can automatically collect new mailing list contacts with your form entries. 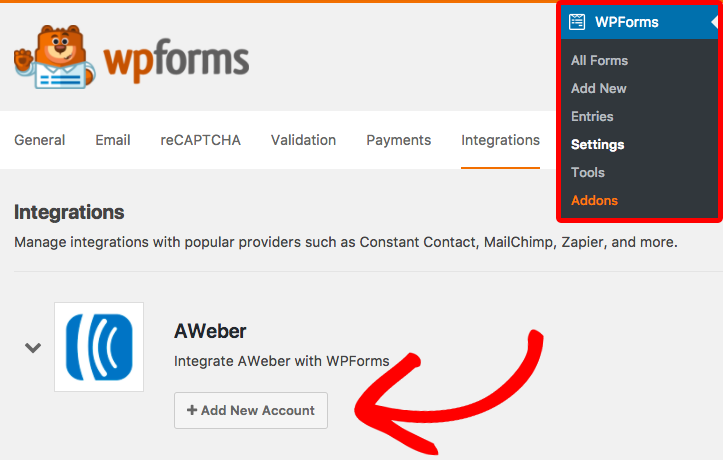 In this tutorial, we’ll show you how to install and set up the AWeber addon for WPForms. Requirements: You will need a Plus license level or higher to access the AWeber addon. Before we get started, be sure to install WPForms on your WordPress site. Next, you’ll need to install and activate the AWeber addon. For more details, please see our tutorial on installing WPForms addons. Once the AWeber addon is installed, you can connect your account. To do this, go to WPForms » Settings and click on the Integrations tab. From this tab, you can click on the AWeber option to open it. Then, go ahead and click the Add Account button. After clicking this button, you’ll see some instructions with a link labeled Click here to authorize. Clicking on the link will open a popup window where you’ll be asked to sign into your AWeber account. Go ahead and enter your AWeber login name and password, and then click on the Allow Access button. 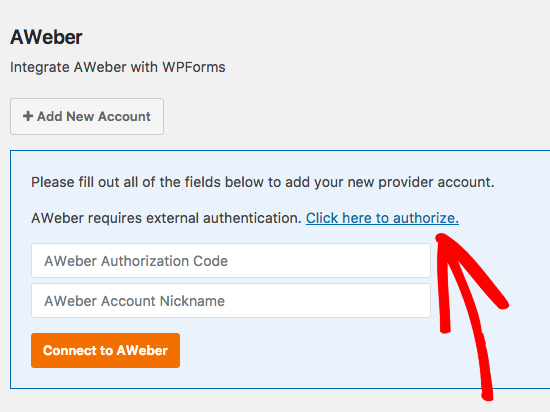 AWeber will now show you an authorization code. You’ll need to copy this code into the field labeled AWeber Authorization Code. Then, enter anything you’d like into the AWeber Account Nickname field. This is for internal reference only, and can be helpful if you later decide to connect additional AWeber accounts. When you’re ready, click on the Connect to AWeber button to continue. 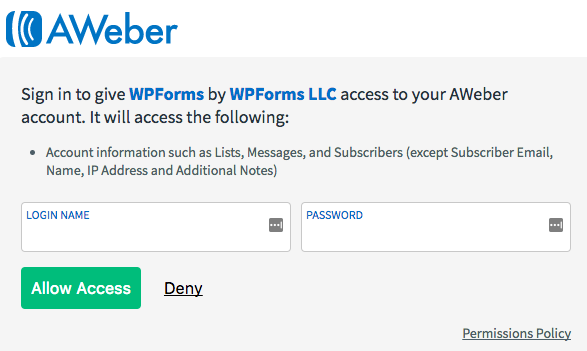 WPForms will now connect your site to your AWeber account. When done, it will show a green Connected status next to your AWeber integration. To add AWeber to a form, first create a new form or edit an existing form. Within the form builder, go to Marketing » AWeber. Within the AWeber tab, click on the Add New Connection button. 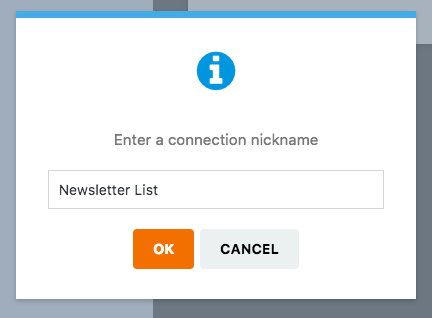 Once the connection is created, you can connect to a specific list from AWeber. If you have more than one AWeber account, first Select Account. Then under Select List choose the AWeber mailing list you’d like to use. Next, the fields from your AWeber mailing list will be listed. The only field you’re required to fill in is Email Address. When you click the dropdown next to Email Address, only Email fields from your form will be displayed. Go ahead and select the Email field you’d like. This all you need to complete your connection to AWeber! If you’d like to customize this connection further, please see the additional options below. 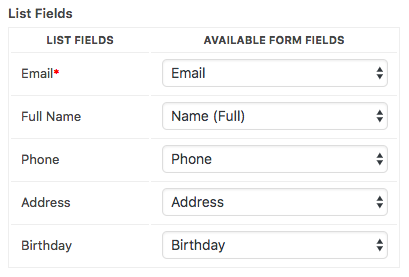 To send additional entry fields to AWeber, you’ll need to map your form fields to any available fields in AWeber. As noted above, the Email Address is required. However, any you can send even more information from your forms using AWeber’s custom fields option. For more details, please see AWeber’s tutorial on how to add custom fields. 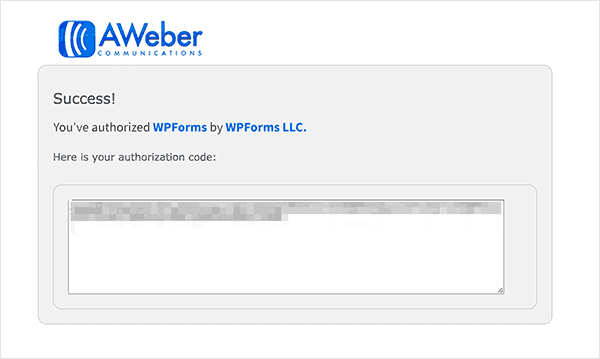 Once you’ve added custom fields in AWeber, they will appear in WPForms. If you’d like, you can also enter any tags you want to apply to these new subscribers in AWeber. For multiple tags, just be sure to add a comma between each. For more details, please check out AWeber’s article on using subscriber tags. For example, you could use conditional logic to allow users to choose if they’d like to be added to your AWeber mailing list. That’s it! You can now grow your AWeber mailing list with each form submission. Next, would you like to offer incentives to gain more subscribers? Be sure to check out our article on lead magnets to find out how to offer downloadable content in exchange for a user subscribing to your mailing list.